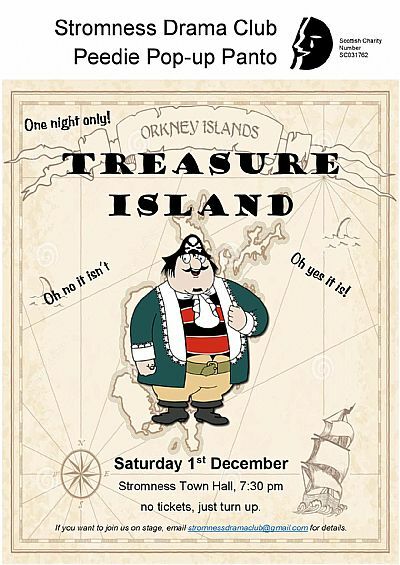 We're only a few days away from Treasure Island, our Peedie Pop-up Panto rehearsed and performed in one day! We still have space on stage for anyone that fancies it - you need to be available from 2pm on Saturday so drop stromnessdramaclub@gmail.com an email to confirm your attendance. For our audience, the doors will open at 7pm for a 7.30pm start, and we won't ask for an entrance fee, rather an exit fee - we ask you to donate on your way out whatever you think the show was worth.